Apelon is a clinical informatics company focused on accelerating eHealth through data standardization and interoperability. We help you create a semantic framework that improves data quality, comparability and accessibility. For over twenty-five years Apelon has collaborated with many of the world's leading public and private healthcare organizations to design, build and deploy clinical terminologies. 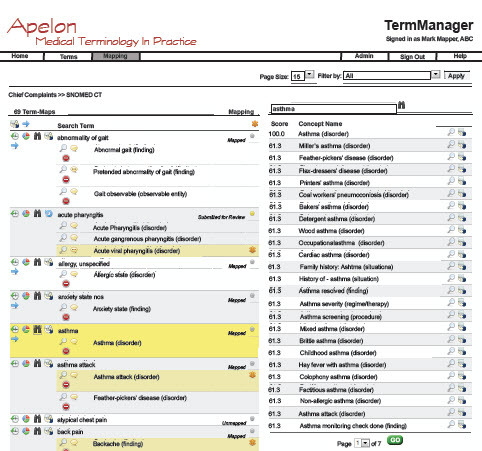 Apelon's personnel: computer scientists, medical informaticists, and clinicians, are recognized experts in vocabulary technology, dedicated to providing practical healthcare information solutions. Apelon is committed to industry leadership, participating in commercial, academic and public-sector forums including AMIA, HL7, ISO, IHTSDO, HITSC, OpenHIE, and others (and if you don't know what some of those acronyms mean, call us and we'll tell you which ones to focus on). Apelon provides a single point of contact for all national and international data standards. Content is available by subscription in standard and custom data formats. Custom data sets and mappings are available to meet individual application needs. Available terminologies include country-specific versions of SNOMED CT, ICD-9 and ICD-10, along with MedDRA, WHOART, RxNorm, LOINC, and about 50 others. Apelon software enables code system management, data mapping, and deployment. Our open source Distributed Terminology System (DTS) is a robust, full-featured vocabulary server. TermWorks and TermManager provide data mapping solutions for organizations around the world. Apelon tools connect to interface engines, order-entry systems, data repositories, health exchanges and decision support systems. From Kigali and Manila to Washington and Toronto, our consultants provide training, advice and technical services to support your terminology and interoperability investment. We assist with data modeling, data mappings, and other implementation tasks including content and software customization. Each and every one of our employees represent the spirit of our company: driven, committed, and acutely aware of how limitless Apelon’s potential is to grow.